I confess. 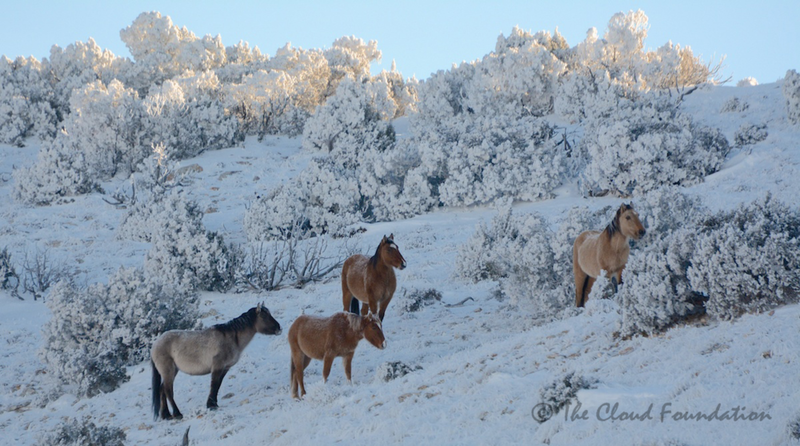 I am obsessed with tracking and photographing wildlife---specifically, wild horses, and particularly Cloud and his family. Even though our communications director, Paula Todd-King endured the Polar Vortex with me in November, she once again volunteers to share my obsession. Try as we could in the sub-zero temperatures of November, we did not spot Cloud. This time we are determined not to return home until we have seen him. But, will our expectations prove to be unrealistic? Day One: The range sparkles in the early morning light. Frost clings to every tree limb and blade of grass. Our trusty canine companion, Quinn, his nose pasted to the backseat window of the SUV, is as excited as we are to be back in Cloud’s home. We round a corner, and to our right Hickok’s band comes into view in a juniper-studded bowl. 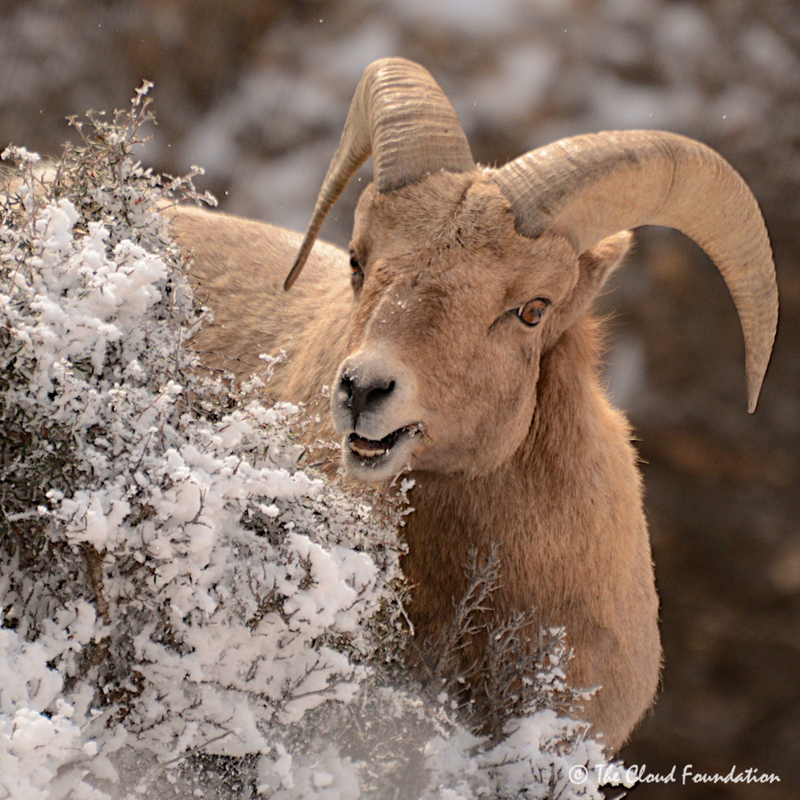 Then, at the Devil’s Canyon overlook, we see Bighorn sheep rams, ewes and lambs amongst mountain mahogany flocked with frost, the dramatic walls of the canyon their back drop. Fool’s Crow’s band is less than a mile away. The mares look good but their blue roan stallion looks a little thin, especially for a nine year-old. Is he being pressured by bachelor stallions in the low country? In November we saw the cheeky dun bachelor, Kemmerer, breed one of his mares with Fool’s Crow looking passively on. Most of the morning has slipped away by the time we head over to the base of the mountain on a red dirt road. Beyond us are the two major spines of the Pryor Wild Horse Range–‑the ridges of Tillett and Sykes. They are separated by a giant canyon called Big Coulee. Out there, in one of the thousands of draws, canyons, cliffs, ridges and drainages, is Cloud—we hope. It has been nearly three months since I’ve seen him. We spend hours methodically glassing every visible inch of Tillett and Sykes Ridges, as well as the mouth of Big Coulee canyon. We see horses—perhaps Flint’s Band; a single apricot dun stallion—maybe Durango? Dark horses on a distant ridge are too far away to identify. We only know one thing for sure. They are not Cloud. It is already mid-afternoon when I pan the scope onto the lowest sections of Tillett. A pale horse. I zoom the scope into maximum power and focus. Encore! Near her we see her stallion, Knight, and farther away, Inali, but London is missing. In short order we drive to the base of Tillett, unload the UTV, and begin driving up the snowy road. By the time we reach the spot where we believe we had seen Encore, the sun is dipping low over the jagged, aptly-named Beartooth Mountains. “You stay here buddy,” I whisper to Quinn. Paula and I walk across deep red soils, made softer than usual from the now melted frost. Below a long ridge we see Inali standing next to a cluster of junipers. Then we spot Knight, and to his right Cloud’s daughter. She is foraging on meager sprigs of grass growing around and under the sage. Knight looks plump compared to Encore. Under her fluffy coat I wonder if there is much meat on her stylish frame. Her beautiful dark eyes are bright, however, and I sense that her strong will may see her through the long winter. At least, I pray it will. Flint Band with Hitaali and Oracle on far right. Day Two: We head up Sykes Ridge where we have views of the low country. We identify Flint’s band. He has picked up Hitaali and her son, Oracle, from Morning Star’s band. I wonder how he pulled that off? Above the mouth of Big Coulee we can make out Indigo Kid and the band that he stole from Cloud’s little brother, Red Raven, last year. We walk far out on Dead Indian Mesa with its eerie, rock formations covered with multi-colored lichens. From the end of the Mesa, we glass out into areas only visible from here. We spot Bolder and part of his band in the dense junipers to the west of a scenic canyon with many caves that I named Cougar Canyon years ago. Nearer the canyon edge we see Mato Ska! The stunning blue roan full brother of Encore looks lovely, but lonely out there all by himself. It is a bit out of the ordinary for such a young bachelor to be all alone. I think it speaks to his confidence. Where's your father boy? I ask myself. Despite this excellent vantage point and hours of glassing, we have no luck seeing Cloud or the family he may or may not have. Day 3: We bring in reinforcements. 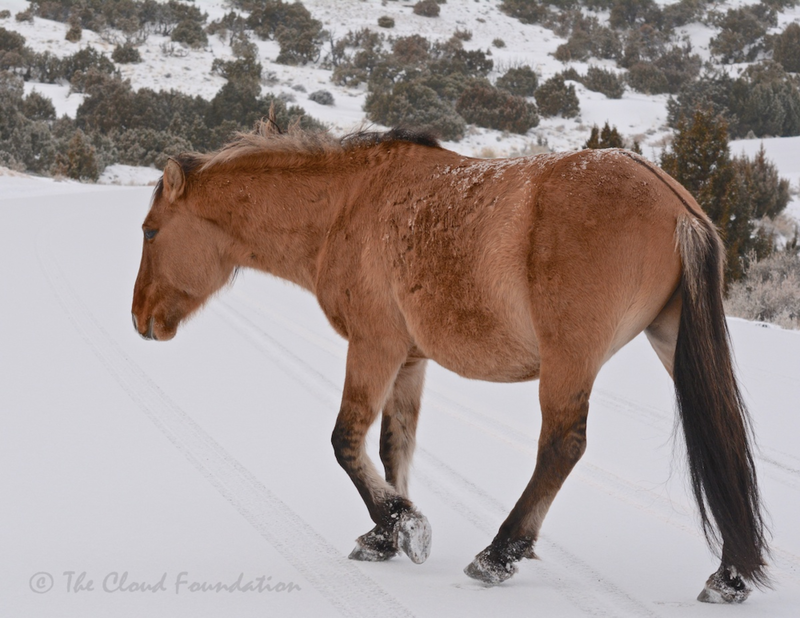 Ace hiker and wild horse spotter, Nancy Cerroni, vice-president of the Pryor Mustang Center, joins us in trying to spot Cloud. Luckily, she and Paula love dogs, because Quinn sprawls over both of them as we bounce up Tillett. We only get stuck in the snow a couple of times, but dig out and continue, only to get hopelessly mired down in drifts on the long red hill below our destination. Undaunted, we begin hiking. Nancy far out distances us and ends up on the high hill beyond the first water catchment where there is a great view of the slopes of Sykes. Nancy eventually spots Casper’s band below her, but no Cloud or his family. Paula, Quinn and I hike to the mountaintop where Nancy saw Cloud and Doc in what she called an “epic” battle last spring, and where Encore, stood and watched. Effie and I stand watching Grumpy Grulla. “Does she look ok to you?” I ask Effie. We watch the nearly 27-year-old who keeps a wary eye on us. “She’s thin,” I say. “She’s old,” Effie responds quickly. “She looks fine for her age.” Effie is one of the best judges of horses I know, so I quit worrying about a mare I have known for nearly 21 years. I named her Grumpy for her stern but consistent style of discipline. Just a sideways glare kept, not just her own foals, but all the foals in Raven’s band in line—even precocious Cloud. While most of our adult horses keep their distance, Lily, who was halter trained as a foal after getting porcupine quills in her nose, and Pistol who was handled by Effie and several little children as a tiny foal and considers all humans as friends, approach Paula. They seem curious about this unfamiliar human. Here was Paula’s reaction: I was unprepared for my encounter with the Freedom Family. 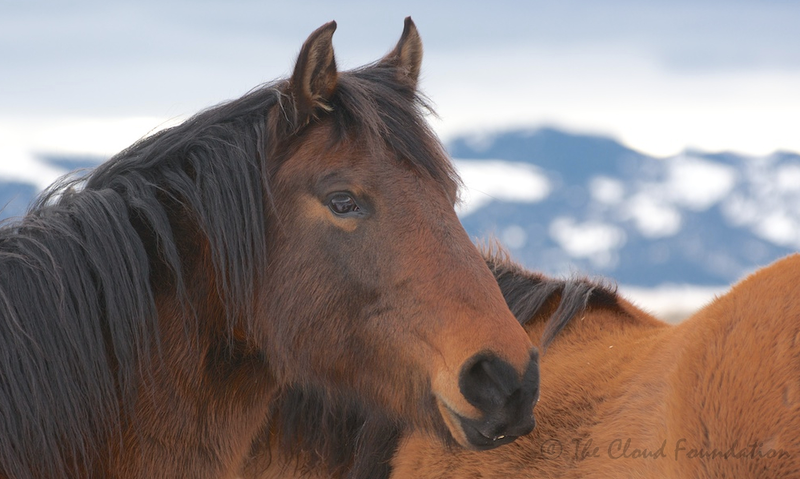 I have observed horses in the wild, and worked with Ginger's gentle mustangs, but when I mingled with the Freedom Family horses I was flooded with overwhelming and mixed emotions. Awestruck at their wild beauty and grace, humbled by their willingness to let me walk with them, saddened by their history, but inspired most by their spirit. As I walked away with tears in my eyes it dawned on me that horses are here to teach us if we only take time to listen. Day 5: We are back in the Pryors, resolved to find Cloud and his family. I have a hunch and we start up Sykes. . . again. A small herd of mule deer tolerate our noisy presence as we bump over the steep trail in the UTV. The former band stallion, Sitting Bull, forages on a ridge with the red desert beyond. We stop and hike to an overlook where we have a little different view of Big Coulee and the ridges of lower Sykes. I aim the scope at the mouth of the giant canyon and begin to pan upslope, focusing on ridges that are miles away, scanning one ridge at a time. When I see a distant pale dot I refocus. A light-colored horse is standing by a tiny bay. It is Cloud and little Orielle is by his side! We hustle back to the UTV, hoping to get back out on Dead Indian Mesa where we will have a closer and I hope, better look. “Let’s hope they’ll stay in the clear,” I say to Paula. Within a half an hour we are hiking to a rock cairn that marks the end of the mysterious ridge. I set up the tripod while Paula pulls out the scope. I peer through the lens, locating the distinctive outcropping that was to the left of Cloud from our earlier vantage point. Then I pan past the familiar slash of a yellow cliff. “There he is!” not even trying to contain my excitement. We can see Innocentes and Cloud, and then Orielle and Feldspar. “Where is Ohanzee?” we ask each other. A tense half hour passes without a sighting of Cloud’s smokey black son.Then we see the colt ambling up to join his sister. "How in the world can we get over there? "Paula asks. I stare into the scope as the two foals break into a spirited run. Orielle bucks and kicks out at her brother who dashes past her. “Paula look,” I say, backing up for her to see. “Oh how adorable!" "I guess that settles the question of how Orielle is faring so far," I say to Paula, who is grinning from ear to ear. Day 6: We made an ambitious plan to try to access Cloud’s ridge. With high hopes, leftover pizza, and an enthusiastic terrier we start at dawn from the gate of the range at the very bottom of Tillett Ridge. In less than an hour we notice Cloud's palomino mother, Phoenix, staring down at us from atop one of the waves of low hills that drop into the flats. Her long time friend, War Bonnet (my Trace’s mother), handsome young band stallion, Hernando, along with Firestorm’s filly and colt, Niobrara and Maelstrom, are with her, picking around, looking for breakfast. How in the world do they find enough to eat down here? I think to myself. We make a left turn into the higher hills, sliding down narrow gorges clogged with snow to reach dry stream beds the color of sunset. A flock of noisy Pinyon Jays flies up from the berry-covered junipers, registering their annoyance. Beyond red, sandstone hills that surround us, we spot distant horses. It takes us awhile, but we finally identify them as the former band stallions, Sante Fe and Jackson. We walk on over hills and into one stream bed after another. Farther on, we see Galaxy’s young mare Maia with her son Orolitto on a far ridge. Nancy said she had seen them with Jasper but we never see the handsome grulla son of Flint and Feldspar. I wonder how Jasper might have stolen Maia and her son from Galaxy? Far below the point of a giant bluff to our left, tall poles jut out of mounds that mark old uranium mines. Quinn leaps from rock to rock then scrambles down to join us. As we walk up what must be an old mining road, we look out in the direction we believe Cloud’s band should be. 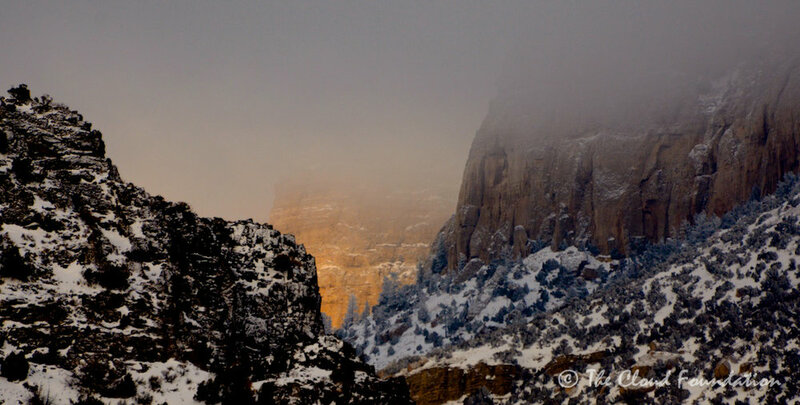 A sea of small canyons and craggy buttes lay before us. No way, I groan. Crossing this imposing barrier and then making our way back to the car before dark is impossible. So, we decide to keep walking up the old road that climbs sharply out of the streambed, contouring a bluff. We’re careful to hug the bluff wall where the road has washed away into a deep draw. The road curves upward and breaks into a valley that splits into two snow-clogged draws. Exactly where are we, I ask myself. We drag on, falling through the snow with each energy sapping step. It is snowing in earnest when we catch a glimpse of Phoenix and her band again before they move away around a bend of the valley. They are miles above where we saw them early this morning. Eventually I see the Tillett Ridge Road where it makes a switchback below the long red hill. "I know this place," I tell Paula. "The road is right over these hills." It was only later that Paula told me she feared we were lost and in real danger. Although I laughed off her fears, I too had experienced a twinge that comes from feeling lost. We hike the four miles or so down the road toward the car with Quinn racing ahead, looking under every sage and juniper for rabbits. Oh, to have his energy. When he finally does scare a bunny out of a bush, he comes back with a whistle. “Good boy, Quinn. The sun is setting when we catch a glimpse of a lovely mule deer buck in the sage and junipers, distracting us from our fatigue. Only a few more bends of the road to go, I think to myself. We're exhausted when we reach the car, and disappointed, but excited about discovering a route from the desert onto Tillett Ridge. The next morning we leave to go home, but agree we have time for one last “quick run” out to the range on the paved road. We’re the first ones to drive into the park and can see the tracks of wildlife that traveled here during the night. A mouse and a rabbit crossed paths on the road. Later we see horse and bighorn tracks. . . and eventually the animals who made them. 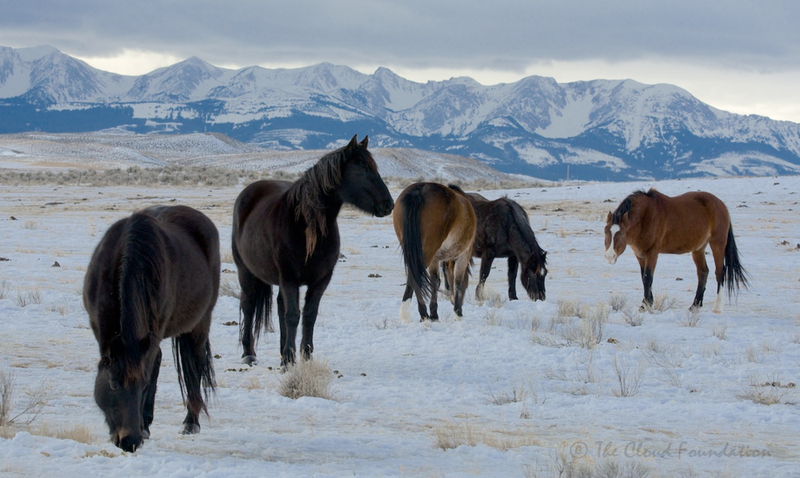 The dun bachelor stallion, Kemmerer is just around a curve from the Bighorns. Eventually he’s joined by Chief Joseph, and the two year-old bachelor, Montana who enjoys a play session with Kemmerer. Of course we can’t let the moment pass, and we take lots of pictures of these handsome boys. It’s early afternoon before we start back to Colorado. So much for a “quick run” to the Dryhead! With reluctant, silent goodbyes, we leave the Pryor Mountains, but we are never far away in our minds. I can still see Cloud and his little family on that distant ridge. Orielle and Ohanzee are racing back and forth, tails held high like flags flying, celebrating another day of precious freedom. PS. Just to clarify, the way we interact with our Freedom Family young horses, Lily and Pistol, as well as Sierra who was captured and halter trained so she could have surgeries on her leg (see film here) several years ago, is completely different than in the wild with the Pryor wild horses or any of the wild herds. In the wild, the mustangs should never be approached. The thrill for me is to remain neutral when in their world so we can view their natural behaviors as if we were not there at all. The general rule is to stay 50-100 feet away, even if the horses approach you. In that case, back up. We manage our Freedom Family Bands, feeding hay in the winter as their pastures will not support them and may be covered in deep snow. We step in if they need help or are injured. This is not and should not be done with the wild herds where nature calls the shots. 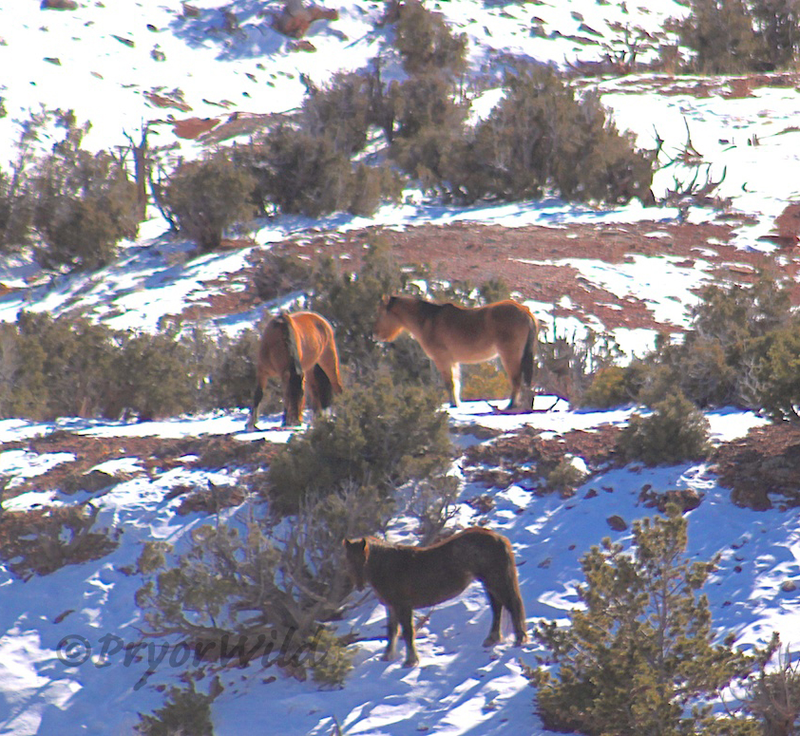 On the Pryors, the BLM steps in to euthanize a wild horse generally only if the horse is down and dying.